Luohu Station (Chinese: 罗湖站; pinyin: Luóhú Zhàn) is an underground terminus of the Luobao Line of the Shenzhen Metro in Shenzhen, Guangdong Province, China. It is located beneath the junction of Luohu Port and Shenzhen Railway Station East Plaza in Shenzhen's Luohu District. It is the second-busiest station in the network in terms of system entries and exits, with approximately 56,400 passengers a day. Opened on 28 December 2004, Luohu Station offers access to Shenzhen Railway Station's Guangshen Railway, and to the Hong Kong MTR at Lo Wu Station. Two tracks run through the station, with platforms on either side; passengers board from the central island platform and alight on the side platforms. This configuration is known as the Spanish solution. 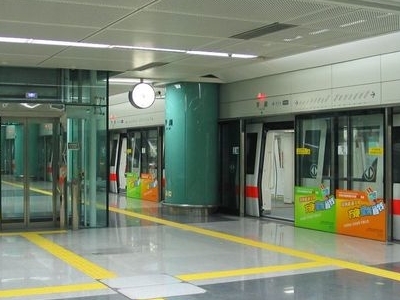 Here's the our members favorite photos of "Metro Stations near Luohu". Upload your photo of Luohu Station!